Three years ago when Fran’s Chocolates decided to move its headquarters from Seattle’s Capitol Hill to Georgetown, officials of the family-owned company weren’t sure what they would do with the old plant at East Pike Street and 13th Avenue. 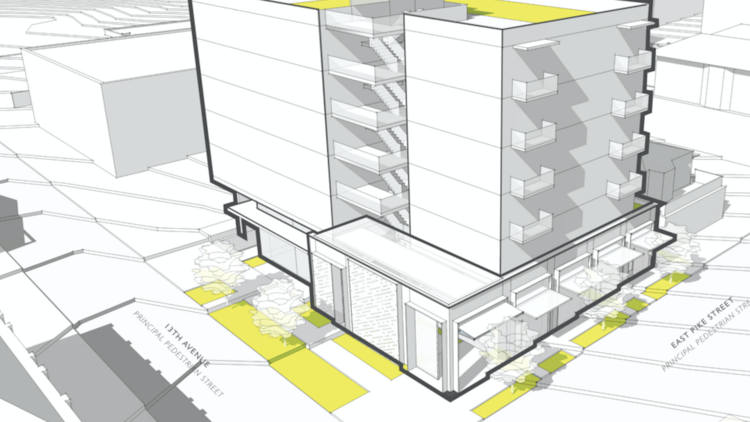 Now they know that it will be redeveloped into a five-story “passive house” apartment building. Passive-house projects are air-tight and built with high-performance windows and extra insulation. That traps in heat from the sun and appliances. This could result in up to 90 percent heating and cooling savings compared to a typical building. “That was big for us,” said Fran’s CEO Andrina Bigelow because her family wanted to do something meaningful with the property where the company operated for around 20 years. The Bigelows are working with Seattle real estate developer Maria Barrientos, who has developed several multifamily projects on the Hill, and longtime friend and general contractor Sloan Ritchie of Cascade Built on the five-story, 50-unit project, which will be among the West Coast’s first passive house apartment buildings. Ritchie is the passive house expert in Seattle. In Madison Park, he built his own home, which is the city’s first certified passive project. And in Madison Park he built Seattle’s first multi-unit passive house development: five for-sale townhouses. More about the townhouses is here. Seattle architecture firm Weber Thompson is designing the apartment building, and hopes the project will start construction in about a year. The cost of the project is to be determined, but it will be more expensive than a traditional development. That could not only drive up asking rents but make it tough to get construction financing, so the team will look for cost savings. “I don’t want to go on the market and say, ‘Gee, these (apartments) are more expensive.’ I would rather say this is the best product out there and we’re comparable on price,” said Ritchie, who wants to show other developers that it’s possible. It’s crucial because the commercial and residential building sector accounts for 39 percent of the country’s carbon dioxide emissions in the United States, according to the U.S. Green Building Council. “We’re in a construction boom now. We’re bringing on thousands of (apartment) units every year, and by not building to these levels we are missing an opportunity,” Ritchie said. He’s working on another passive house apartment project in Seattle, a 35-unit project at 3700 S. Hudson St., in Columbia City. Cascade Built is doing that project on its own, and hopes to break ground later this year. The nation’s largest passive house rental project is in Hillsboro, Oregon. Click here for the Portland Business Journal’s coverage of the development.